Are you a big fan of gel manicures? I have to admit, I've never been attracted to them, simply because they always seemed too time consuming and inconvenient - from the light curing to the removal process. 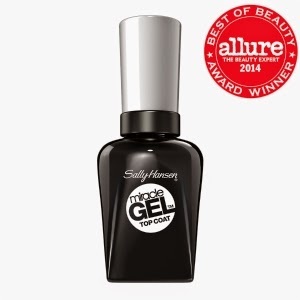 But Sally Hansen Miracle Gel is the perfect product if you're like me - you want the best of both worlds: A long lasting manicure WITHOUT all the hassle of going to a salon for application or removal. The products look and feel like traditional nail polishes and the application is the same. Since I wanted a color that I could live with for over a week, I chose this nice neutral,Truffle Shuffle. I applied a base coat, then two coats of Truffle Shuffle (shown, at top). Truffle Shuffle is a nice creamy caramel, opaque and very shiny with the top coat. I have to say, It did look exactly like gel manicures at the salon. As far as wear, I was able to get about 5 days with very little chipping at all. Then after about 3 more days I did see more chipping on the tips (but this is with me using my hands a LOT that particular week). I would say I could go about 8-10 days before having to remove, which is not quite the 14 mentioned in their product claims, but still very impressive. This is perfect to apply before going on holiday for an extended period of time, when you know you won't want to think about your nails, but still want them chic and put together. This also lasts a bit longer than the 10 days on the toes. To remove, all I needed was a standard nail polish remover, and the color came off quickly and easily - yay!